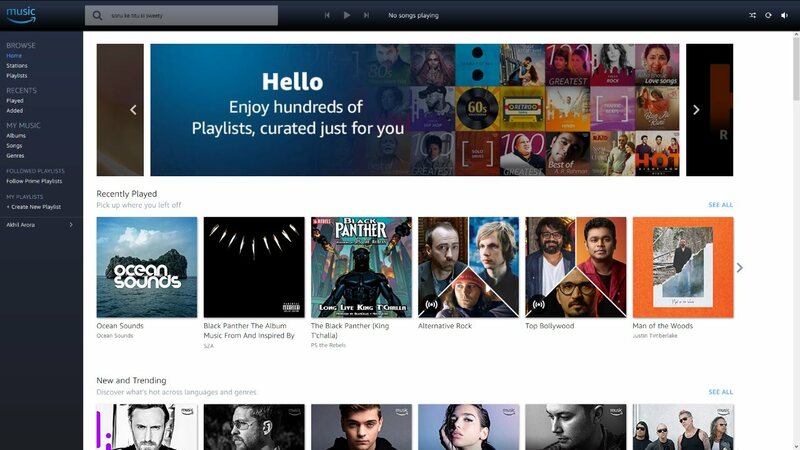 Amazon Music has been given a full-scale launch in India, the subscription-based music streaming service that's part of Amazon Prime membership. You can now access it via music.amazon.in, or download the Amazon Music app on Android, iOS, Fire TV, Windows, and Mac. (There's no app for Android TV, sadly.) Previously, Amazon Music was restricted to users of the Amazon Echo smart speaker lineup in India. Notably, Amazon has used 'Amazon Prime Music' branding in some places, however, the actual service and apps are called Amazon Music. At first start, Amazon Music will ask you to select your music preferences by language: Hindi, English, Punjabi, Tamil, Telugu, Kannada, Malayalam, Marathi, Bengali, Bhojpuri, Gujarati, and Rajasthani. It'll use that information to prioritise what you see, but it doesn't act as a filter. That means you'll still see playlists from languages you don't select. If you've already been using Amazon Music on your Echo device, you'll see your playlists and albums in the recently played section. Since Amazon Music is part of Amazon Prime, it costs Rs. 999 for the full year. That's Rs. 83.25 per month, which makes it more affordable than the big two: Apple Music at Rs. 120 per month, and Google Play Music at Rs. 99 per month. It's different for students: Apple Music is the cheapest at Rs. 60 per month. Amazon Music won't be available as a standalone subscription, and there are no plans for student or family memberships as well, Amazon told Gadgets 360. Of course, a music streaming service is more than just the price. Both Apple and Google claim around 40-45 million songs in their catalogue, while Amazon India claims "tens of millions of songs" and wouldn't commit to a figure. While Amazon has two options in the US, 2 million songs with Prime Music (part of Amazon Prime), and 40 million songs with Music Unlimited (a standalone service worth $8 per month with Prime, $10 without), Amazon is focusing on a single route in India. For what it's worth, we were able to find recently released albums, such as Black Panther The Album: Music From and Inspired By, Twin Fantasy by Car Seat Headrest, and All at Once by Screaming Females. On the Bollywood side, new albums such as Sonu Ke Titu Ki Sweety and the new single Sanu Ek Pal Chain from Raid are available, though we couldn't find the soundtrack for Hichki, which is available on Apple Music. Amazon India also claims to have done a lot of research on other Indian languages, to help users discover the music they love faster. That's why in the genre section, you'll find options such as Carnatic Classical, Devotional, Ghazals, Hindustani Classical, Rabindra Sangeet, and Sufi & Qawaali in addition to the usual ones.